Swindon Bike Doctor comes to you! FREE collection & delivery from your home or work at a time to suit you. In a hurry? The Bike Doctor will collect your bike from you, saving you time & money. Fast and easy. Call me, Phil Mitchell, Swindon Bike Doctor today, day or evening on 07850 650956 or 01793 874873. 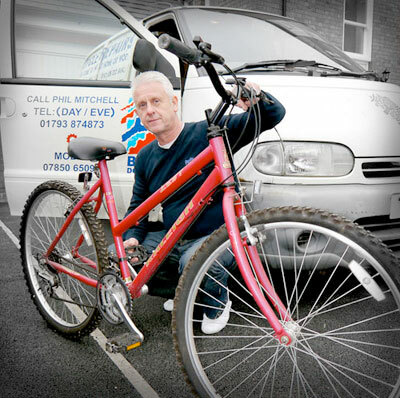 Over 35 years experience in bicycle repairs and servicing. All work guaranteed, giving you peace of mind. I also sell cycle parts and accessories for all makes of bicycles too. Bikes bought on the internet or mail order should be set up and serviced before being ridden. Make sure you are safe. Call the Bike Doctor for a quote now on 07850 650956 or 01793 874873.